A giant steaming Titan appears outside of Wall Maria before kicking a hole in it, allowing hordes of other Titans to enter the well-populated Shiganshina District. There’s mass panic as these odd humanoid looking creatures begin to feast on the people, including the mother of Eren Jaeger. He won’t forget this and vows revenge on the Titans for the rest of his life, whilst you bear your own burden as an unknown character that was also caught up in this mess. What part will you play in the fight to save humanity? 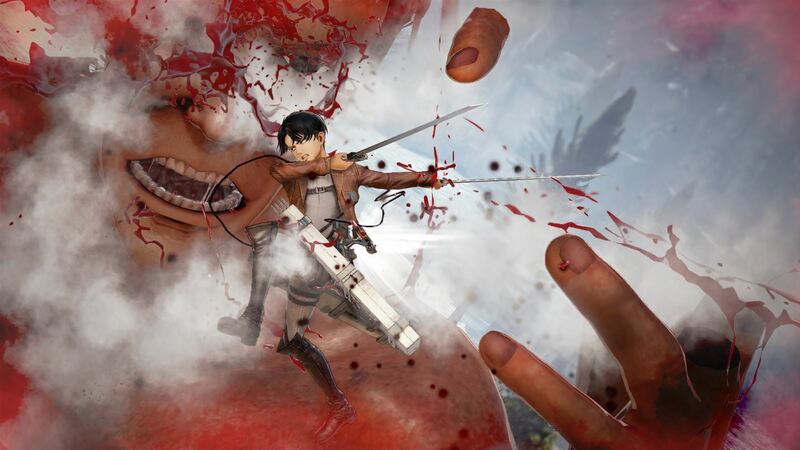 The Story Mode begins with the devastating Titan invasion led by the Colossal Titan, which sees Eren Jaeger and friends – Mikasa and Armin – decide to make it their mission to fight back in the years to come. Little do we know that there’s another youngster hell-bent on vengeance in regards the actions of the Armored Titan at the same time. That’s our custom created character and the whole story is told from their perspective, with a Scout Journal being the source of the tale. The amount of customisation options are more than adequate to create a character that either stands out from or blends into the ranks effortlessly. It doesn’t matter whose eyes witness it though, because the same old events of season one of the anime are repeated. That’s the game’s first mistake. 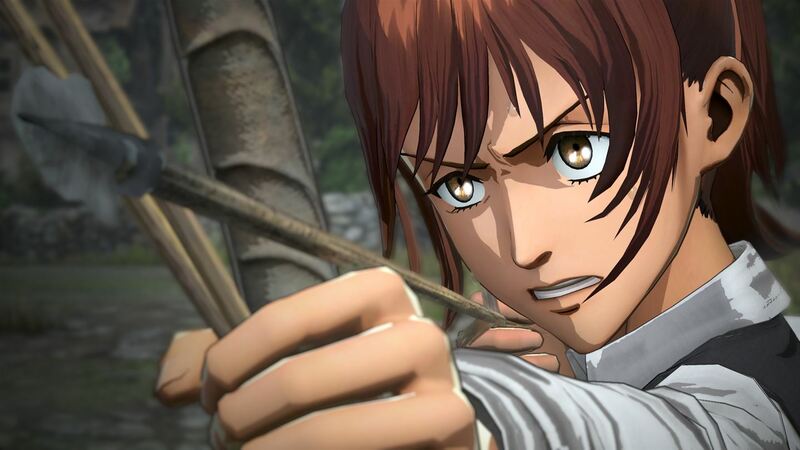 Who really wants to go over training for the 104th Cadet Corps again, discover Eren can transform into a Titan, or chase down the elusive ‘Female Titan’? Apart from those venturing into the A.O.T. series for the first time, I doubt anyone would as it’s incredibly monotonous and at least ten hours will pass before you even reach the new content based on the second season. And whilst the experience is enjoyable until this point, having fresh moments to recreate makes for a far more interesting affair. Even the storytelling is better, with raw emotion in the cutscenes really firing you up to take those creepy Titans down. The gameplay found in this sequel hasn’t changed an awful lot, with most missions consisting of swinging through the environments like Spiderman, using the omni-directional mobility gear and decimating the nearest Titan in order to protect citizens and fellow Scout Regiment members. After locking on to an arm or a leg, you’ll sink your hooks in and reel yourself close enough to take a swipe with a blade. Ultimately you just need to fully damage their nape to kill Titans off, but removal of their legs and arms in the process ensures they are weaker to your advances… plus it’s more rewarding and fun to show your sadistic side. The range of Titans is impressive too, with ‘normal’ types that are slow to react, smaller abnormal ones which are faster, as well as the much larger Titans that need more patience to slay. That’s without mentioning the utterly bizarre, seemingly ravenous, variety who behave like demented creatures. Zipping around the battlefields from Titan to Titan, and removing body parts piece by piece can get a tad repetitive though. 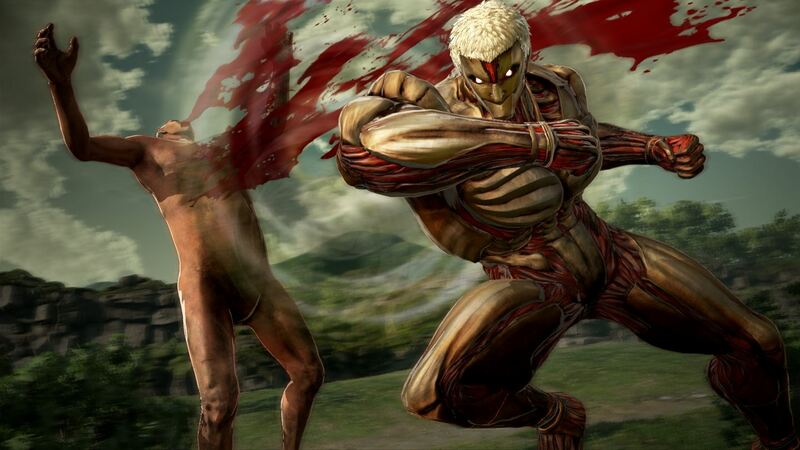 Normally, I’d be all over the hacking and slashing of limbs, however the annoyances brought about by the ragdoll physics of limbless Titans are a real pain in the backside. Slice off a leg and the rest of its body will flop about, merge into buildings and make it incredibly difficult to lock onto another part without it disconnecting the anchor line, leaving you to find a new angle to approach from. It’s even worse in the forest when trees break the line frequently and delay you from assisting someone in need. The bodies regularly fall on top of you too, and between the mounds of flesh and the surrounding environmental structures getting in the way of the camera angle, it can sometimes disorientate you. That’s not ideal when these naked beasts want to devour you at any chance they get. Unlike the previous game, you won’t be using any characters other than your own in Story Mode, so levelling up by earning EXP is crucial. The higher the level you are, the more skill points become available to equip a variety of skills which give stat boosts and abilities that’ll help your overall adeptness is battle. The stats are split up into six categories; Strength, Agility, Dexterity, Health, Concentration and Leadership, and aside from equipment based stat bonuses, these skills are the only way to improve those of your character. Acquiring skills is an important factor in ensuring you’re prepared for the battles ahead and in order to do so, you must build relationships with others. Outside of conflict, in the barracks and such, you can interact with all sorts of characters from the anime series to try and become a better friend to them; literally everyone from the likes of Sasha, Christa and Conny, to Levi, Kitz and Erwin are present. Choosing the correct response during a conversation helps increase the strength of the friendship and at certain levels, you’ll be rewarded with a skill. Other ways to please your friends include giving gifts – because buying friends is much easier than trying to win them over with words – and working alongside them in the heat of the action. This isn’t the only new feature though, as during missions you can build bases to boost your chances of survival. These come in many forms, with artillery, support and resource types at your fingertips, coming in very handy for the hordes of Titans bumbling towards you. The new buddy actions are incredibly helpful too as you’re able to recruit characters to your team and they can support in battle; including eliminating a Titan with a joint attack and the teammate transforming into a Titan if that’s their power. That in itself is very cool. Another addition to A.O.T. 2 sees the opportunity to wear down Titans and capture them for research purposes, which in turn lets you take it for a spin as part of researching. Whilst in control of a Titan, the aim is to devour the poor citizens and avoid being taken down by any do-gooders. Scout missions return, offering an alternative route to earn EXP by completing a whole load of different, but quite similar, scenarios. It’s a great way to get people to like you apparently, as well as earning more resources and funds to upgrade the ODM gear and blades etc. And whilst that’s everything the Story Mode has to offer – apart from going through it again on the harder Inferno difficulty – it’s still plenty to keep you going for a long time. A friend can even assist in the story via online co-op if desired, although the method to go about this is convoluted to say the least. There is another mode to tackle, and I’m not kidding when I say that it’s called Another Mode. Here, scout missions are available to complete using your favourite characters and their awesome skills, gaining rewards for doing so. Another Mode is also the home of the online focused options and unless you have friends, you will struggle to get anyone joining in as the number of online players appears to have dwindled down to almost none. The matchmaking setup doesn’t make things easy though, with time limits kicking you out of the lobby if no one joins within a few minutes, forcing you to host again. Should you be fortunate to gather a group together, there’s a 4v4 Annihilation mode which pits teams against each other to eliminate Titans and earn the most points for when time is up, Predator mode sees you controlling Titans and causing havoc to achieve points, and finally, it’s every player for themselves in Expulsion as up to six people compete in the eradication of Titans. These could add a bit of longevity, however, in reality it’s just more of the same gameplay that you’ll possibly be sick of after the story finishes. Visually, there’s a definite improvement in the way the locations look and the characters are all instantly recognisable, with a decent amount of detail in the uniforms to add that extra little touch. The grim nature of the horrific scenes of people being eaten and crushed is encapsulated by the gritty atmosphere created in the cutscenes, whilst the soundtrack helps to bring the mood up and down to a decent standard. I’d love to comment on the voiceover work, but my Japanese is severely limited – but don’t worry, subtitles are included. If the intensity and emotional ranges are anything to go by though, they must do a great job as I could feel the change in mood despite not understanding a word. A.O.T. 2 offers a huge story mode and a ton of lore to get stuck in to, which is ideal for newcomers, although initially the controls can be tricky to get to grips with. Slicing and dicing Titans is the order of the day, but it can get repetitive after a while, especially when glitches and silly body physics hinder your attacks. 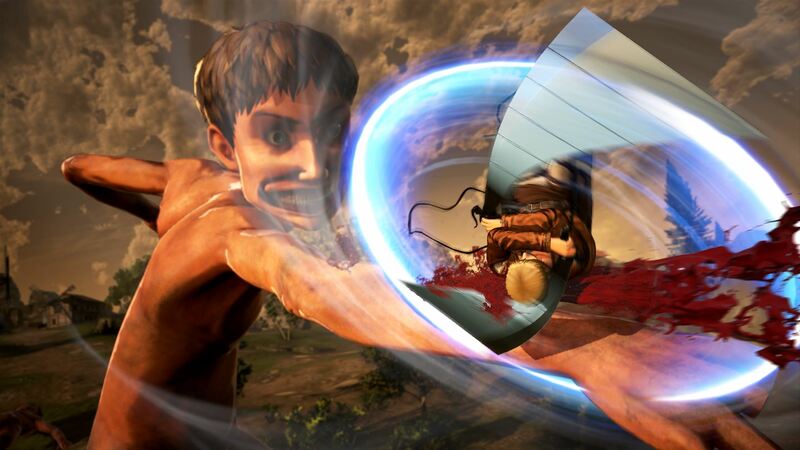 For players returning to the series, there’s a lot of old ground covered, however it’s worth it for the brand new content from season two of Attack on Titan and the new features help with the tedium. Sadly, the online side of things has died already and anything outside of the story seems monotonous. 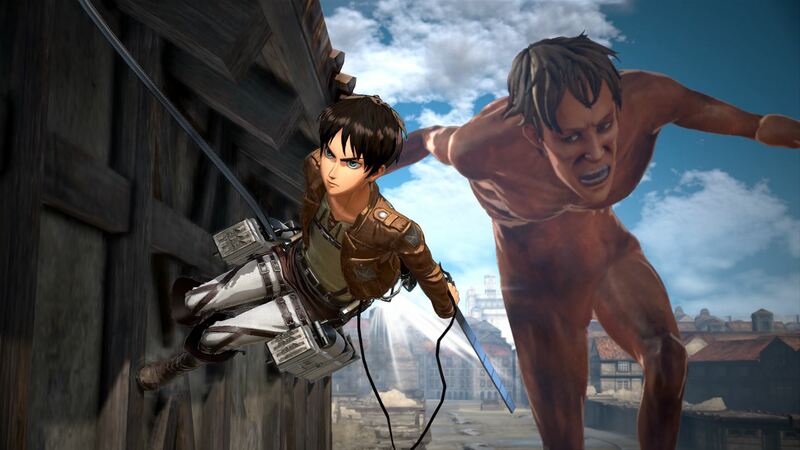 In truth, Attack on Titan 2 is more of the same as that found in Attack on Titan: Wings of Freedom – just less exciting and slightly more frustrating in comparison. Die-hard fans will no doubt have fun with the new features whilst newcomers will enjoy it, but everyone else… well, it depends on how much repetition you can bear. Previous articleThe Gaming Hub Podcast Episode 94 – Red Dead Redemption 2 Trailer Reactions and Much More!